Love and Life at Leadora: Which Witch is Which?? A few years ago, my mother and I purchased this Halloween witch at Costco. This year we thought it would be interesting to share with our blog friends how each of us decorated our witches! You can see my mom's Halloween witch here. 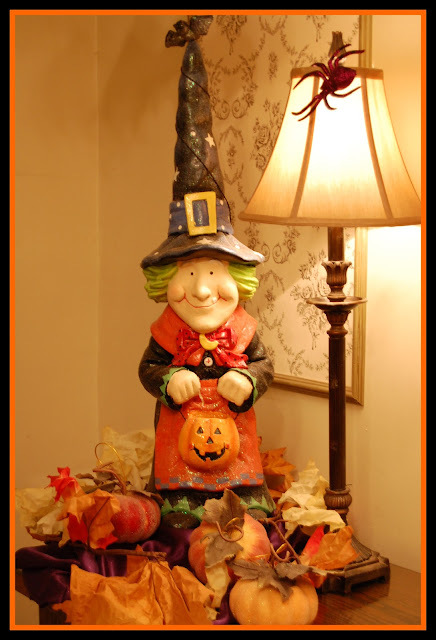 My Halloween witch sits in the dining room on the sideboard at Love and Life at Leadora. Black bats fly above, and a yellow crescent moon hangs from the ceiling. When you visit La Vie Quotidienne, you will notice that my mother loves ceiling ornamentation. With her in mind, I taped black butcher spider webs to the ceiling. I am participating in Metamorphosis Monday at Between Naps on the Porch. Oh...far too cute! I love everything about it...the bats, the moon, the spider web. Totally adorable! You are so creative. And, great pictures. (-: I am sure your little witch is having a fun Halloween. Oh, I'll bet your kids are loving this! What a perfect tableau. That is so cute. The countdown board it too fun and I love the bats flying all around. Makes me wish I had gotten on the ball and done more for Halloween!!!!! So cute! Love the flying bats! Very cute - I love the whole setting with the moon, bats - but my favorite is the spider on the lamp! The setting is sweet...I especially like the bats. Happy soon-to-be Halloween! Love your witch!! Thanks for stopping by and commenting. Be sure to link up to Happy Hour Wednesday. I'm having a CSN giveaway! So fun to have your mother to join the fun of decorating. My kids are just not interested . I have a good witch stop by if you can find the time. Cute witch display... fun that you and your mom have similar tastes with a little different flare for style. I like them both! What a cute little witch. I love the idea of bringing the decorations up onto the ceiling. Can't wait to see your mom's little witch, so off I go. Have a wonderful day and Happy Halloween! Hey Heather! 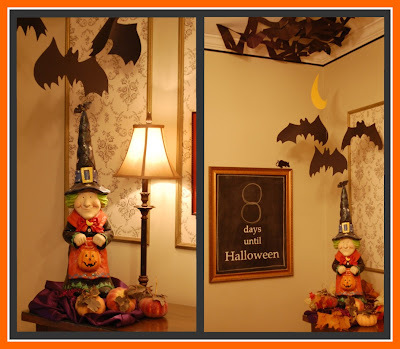 I absolutely love how you decorate for Halloween- so cute and happy! You porch is fantastic, I'll admit I'm a bit envious! I so wish I had a front porch! Someday! I also loved the cute little mice you had on your corner cabinet. I've done the same idea with bats but the little mice are so fun- I'm definitely going to have to add some to my Halloween decor! Thanks for all the inspiration!